Did you know you can visit Northwest Coast Salish and Northern Plateau art and cultural displays around the state? Check out these unique collections. The Burke Museum is on the University of Washington campus and has a 125 year old collection of natural history and cultural of the Northwest and Pacific People. Visit the Pacific Voices Gallery to see artifacts, hear voices of tribal elders and ceremonies vital to the cultural identity of the Coast Salish people. www.burkemuseum.org. 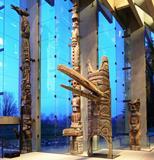 You’ll find galleries featuring contemporary totem carvings, baskets and painting in Seattle, Victoria, Vancouver B.C. and in Alaska. If your tour takes you to the east side of the Cascades you’ll find the history and culture of Northern Plateau Indian Nation captured in outstanding collections in these locations. Chelan Co. History Museum & Pioneer Village in Cashmere has artifacts from the middle Columbia River and the lower Snake River including petro glyphs and pictographs believed to date to over ninety centuries ago. www.cashmeremuseum.com.